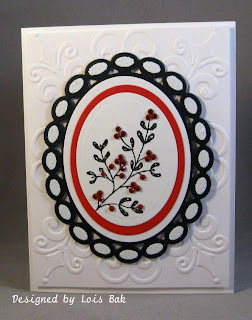 Our hostess this week for the Stampin'B's DT challenge was Joanne (a/k/a jojot), and we all know her favorite color combination -- red, black and white! So it was no surprise that these were the colors she chose for the color challenge. This was a pretty simple card to make -- and I got to play with lots of new toys. I used a new Sizzix embossing folder for the background and the Nestabilities beaded ovals for the frame. After cutting and embossing the beaded ovals, I sponged the openings with SU Whisper White and then embossed with Detail White embossing powder. I added a couple more layers (one white and one red) before I added the top white layer on which I had stamped the image with Versafine Black Onyx and clear embossed. Then I added some red bling. 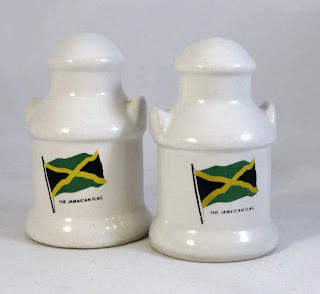 As this was a color challenge, I had to find a pair of red, black and white salt and pepper shakers. 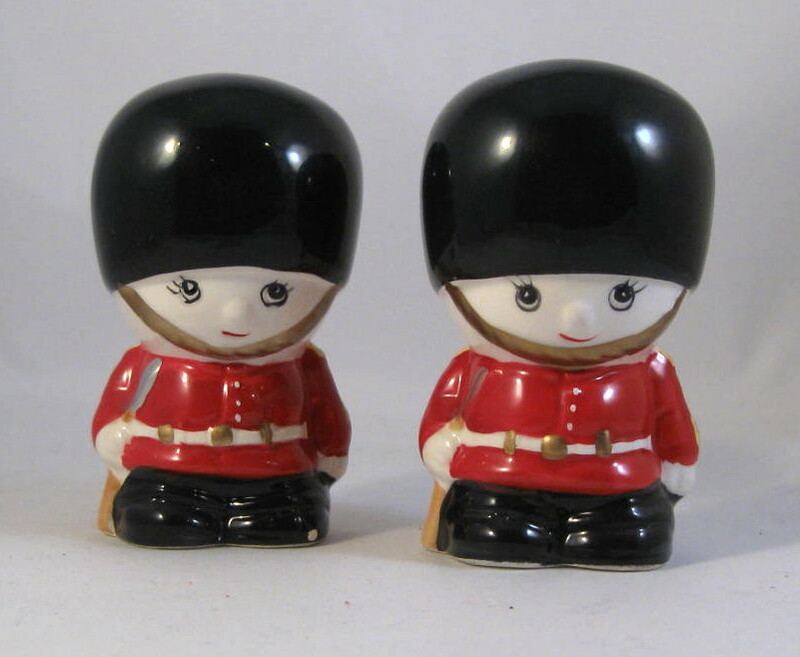 A friend of mine brought these back from London for me. 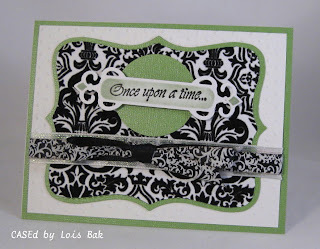 Vicki Dutcher was this week's hostess for the Stampin'B's DT Blog Challenge. She wanted us to put piercing on our cards. I used one of my Pierceabilities dies to make the border. After cutting the scallop bottom and piercing the design, I sponged some Tim Holtz Wild Honey and Spiced Marmalade on it. 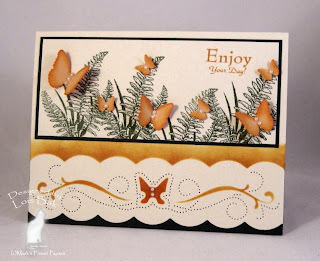 I stamped the ferns in Jardin Moss to match the mat and the sentiment in Wild Honey to match the butterflies, which are punched with two different Martha Stewart punches. I added some pearls for a little elegance to all the butterflies, including the one in the piercing/sponged border. Then I taped another piece of the dark green cardstock under the bottom to show off the scallops. All images and materials are available at Mark's Finest Papers. These are the only salt & pepper shakers I have with butterflies. 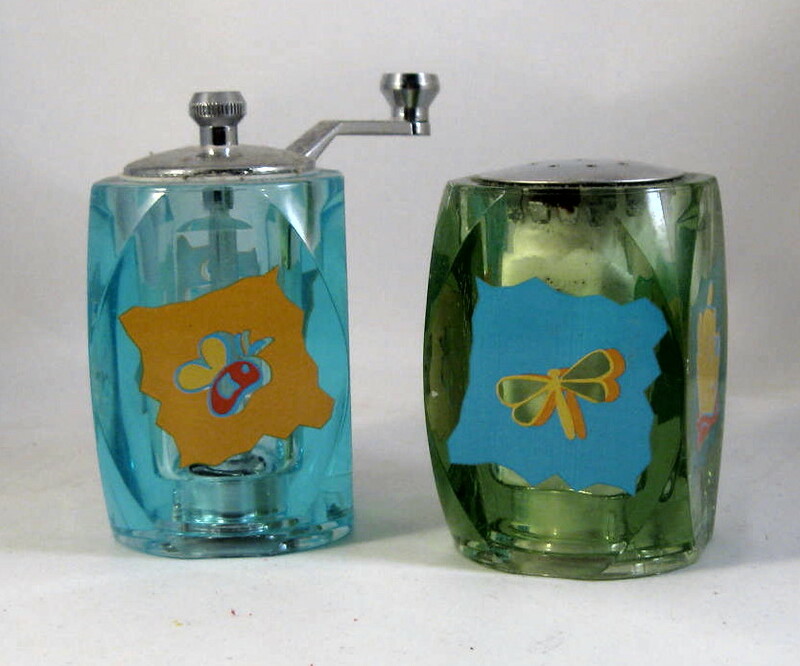 Actually, the butterflies are secondary to the designs on the shakers. They are actually Winnie the Pooh shakers. Winnie the Pooh is on one of the other sides. Vicky Gould was this week's hostess for the Stampin'B's DT challenge blog. She wanted us to make a card with food of some kind -- bonus points for picnic food. I thought cupcakes were good for a picnic! 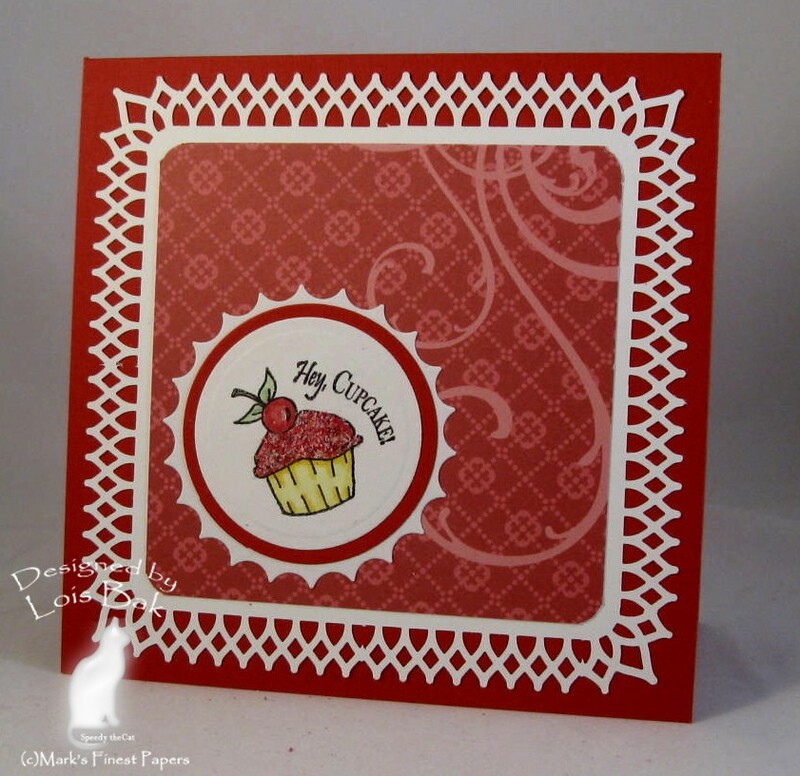 I stamped the smaller cupcake from Mark's Finest Papers' Cupcake Birthday set and then curved the sentiment a little so it wrapped the top of the image. After coloring the cupcake with Copic markers, I put some new (to me) Ultrafine Raspberry Fizz Flower Soft on the icing. Let me just say here -- I love this stuff! The border was created using two Martha Stewart punch-around-the corner punches I found on the clearance rack at Michaels. Gotta love a bargain! The DP is from DCWV's The Sweet Stack. 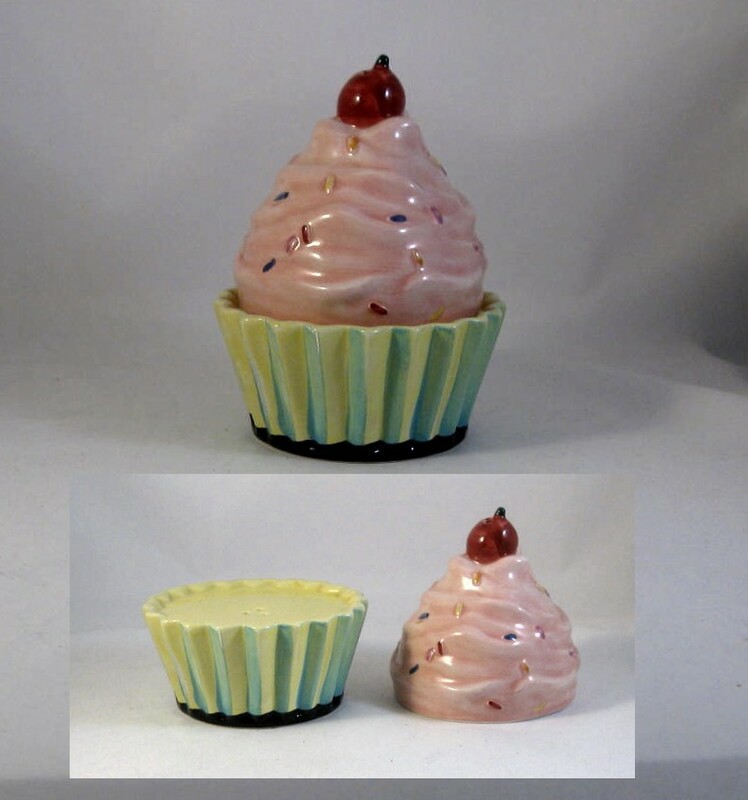 My salt and pepper shakers today form a cupcake when stacked one on the other, but I wanted to show you that there are actually two pieces. 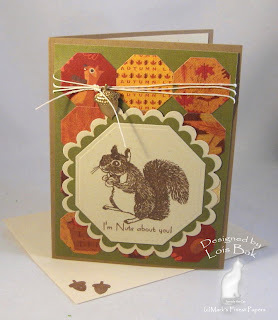 Welcome to the Mark’s Finest Papers September Blog Hop! This month, we’ve added two new DT members and have shortened link lists! 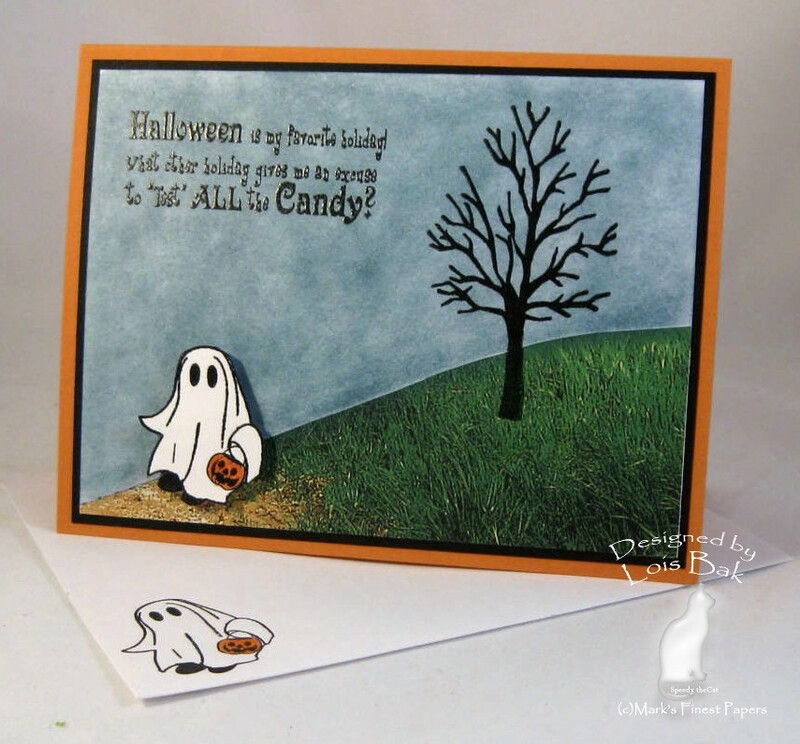 While I’m not officially part of the Blog Candy hop today, thanks for stopping by and looking at my projects. We have 4 New Stamp Sets Released this week: Autumn Fun, Broom Rides, Stinky Situation, and Thankful Mums and Pumpkins. For your convenience, all 4 stamp sets are available for purchase TODAY! For your chance to win BLOG CANDY, (a set that will be released NEXT month), visit and comment on each of the other design team members' blogs. On Saturday, (September 11, 2010), a winner will be chosen from those participants who visited all the blogs listed for today. (There will be four different winners, one winner for each day of the blog hop. You DO NOT have to comment every day. However, the more days you comment, the more chances you have to win!) If you miss a day, you can go back and comment on each day's blogs, as the winners will be chosen Saturday morning! 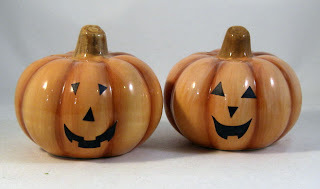 We end the Blog Hop with Thankful Mums and Pumpkin. Both of my projects for today are 3-D. 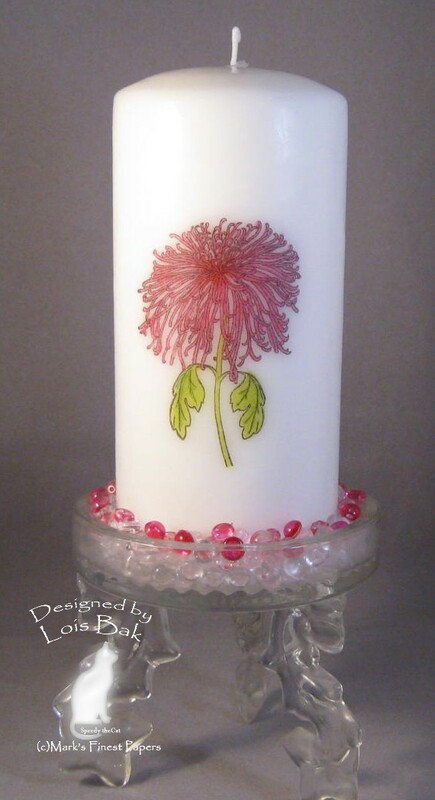 The first is a “stamped” candle. Actually, you stamp on a piece of tissue paper and “melt” the image into the candle. For complete directions, here is the tutorial from SCS. I love pumpkin butter, as do many of my friends. Here is a little gift set you could present to someone for almost any occasion this fall. 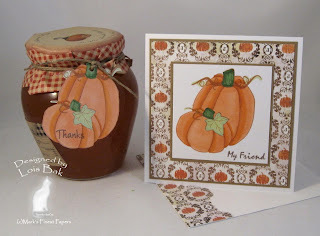 I made a “thank you” tag using the pumpkin image and tied it with hemp twine around a purchased jar of pumpkin butter. The accompanying note card uses the same image and some DP from Basic Grey’s Eerie paper pad. I think these “critter” pilgrim salt and pepper shakers are so cute. Welcome to the Mark’s Finest Papers September Blog Hop! This month, we’ve added two new DT members and have shortened link lists! And…LOOK for a NEW LINK LIST TOMORROW!!! For your chance to win BLOG CANDY, (a set that will be released NEXT month), visit and comment on each of the design team members' blogs. On Saturday, (September 11, 2010), a winner will be chosen from those participants who visited all the blogs listed for today. (There will be four different winners, one winner for each day of the blog hop. You DO NOT have to comment every day. However, the more days you comment, the more chances you have to win!) If you miss a day, you can go back and comment on each day's blogs, as the winners will be chosen Saturday morning! 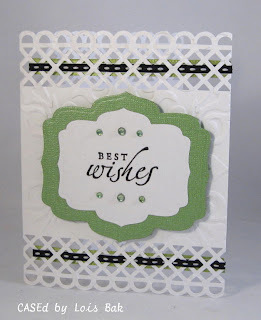 I was the hostess for this week’s Stampin’B’s challenge – a color challenge (pink, blue, and green). I made this little Post-It note holder using the tutorial on SCS. The papers from Basic Grey’s Euphoria paper pad use the three colors in the challenge. The cute little porcupine from Stinky Situation is stamped in Palette Noir Black and clear embossed. Did you get the connection? Sticky notes . . . porcupine quills. Sorry about that! My late husband always said I had a weird sense of humor! I love the birch tree image from this set. 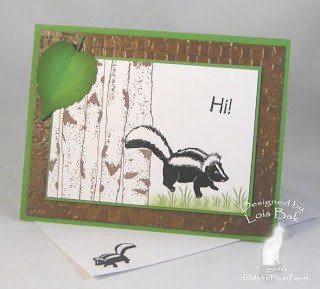 After stamping the larger of the two skunks in Palette Noir Black (clear embossed), I masked it and stamped the birch trees in Memento Rich Cocoa. One of the leaves from a 4-die Cuttlebug die set looks very much like a birch leaf. It is glued down on just half, with the other half raised up. 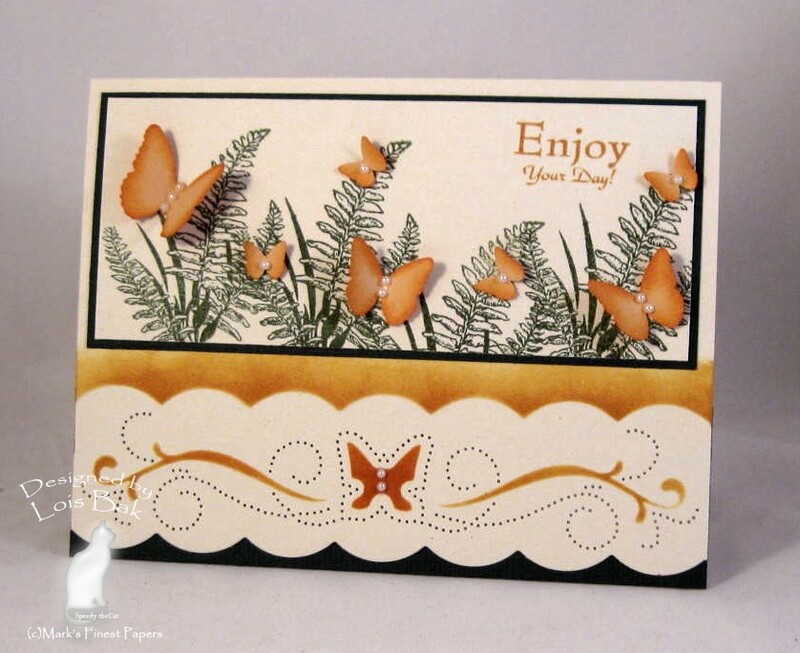 The brown background (MFP Hazelnut) was embossed using one of the Tim Holtz embossing folders, then stamped with Versamark all over and clear embossed. IRL it almost makes it look like leather. 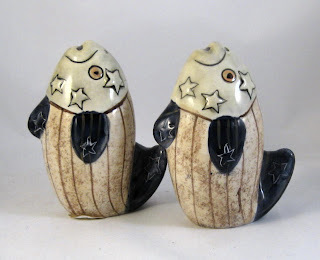 I have neither porcupine nor skunk salt and pepper shakers, but I thought these armadillos would work with today’s critters. Again I have created two projects with today’s set – Broom Rides. 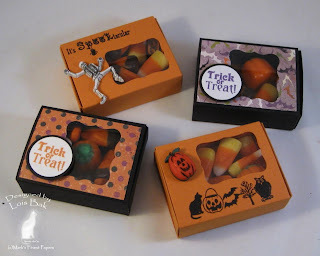 I love these little matchbox treat boxes created with the Sizzix Bigz XL die and the Big Shot. Two of them are decorated with DP and the other two are stamped with images from Broom Rides and “buttons” from Michaels. My hill on my card was created by cutting a piece of “grassy” DP and stamping the tree at the top. The cute little ghost is popped up on a pop-dot. After coloring the sky with chalks, I stamped this wonderful sentiment in black. Do you want to be the official “tester” of Halloween candy? What a fun job! These jack-o-lanterns are part of my salt and pepper collection. Be sure to visit the rest of the team to see what they did with this fun set and comment on each blog. 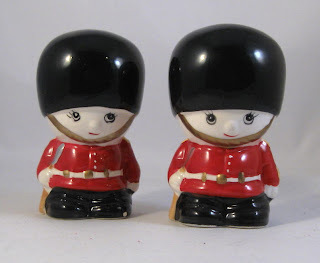 You have a chance to win one of the stamp sets to be released next month. We have 4 New Stamp Sets Released today: Autumn Fun, Broom Rides, Stinky Situation, and Thankful Mums and Pumpkins. For your convenience, all 4 stamp sets are available for purchase TODAY! 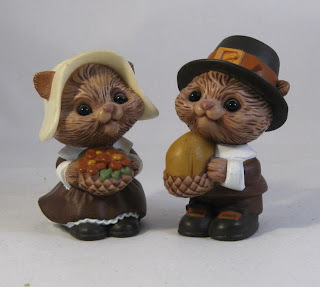 I’m starting off the Hop with two projects for today’s set – Autumn Fun. For my card, I created the background by cutting small octagonal shapes from K & Company’s Fall Harvest Mat Pad DP and gluing them down on the green panel. I stamped the squirrel from Autumn Fun onto MFP Corn Husk, which is cut using a larger octagonal Nestabilities die and matted twice. I added some twine and an acorn charm at the top. 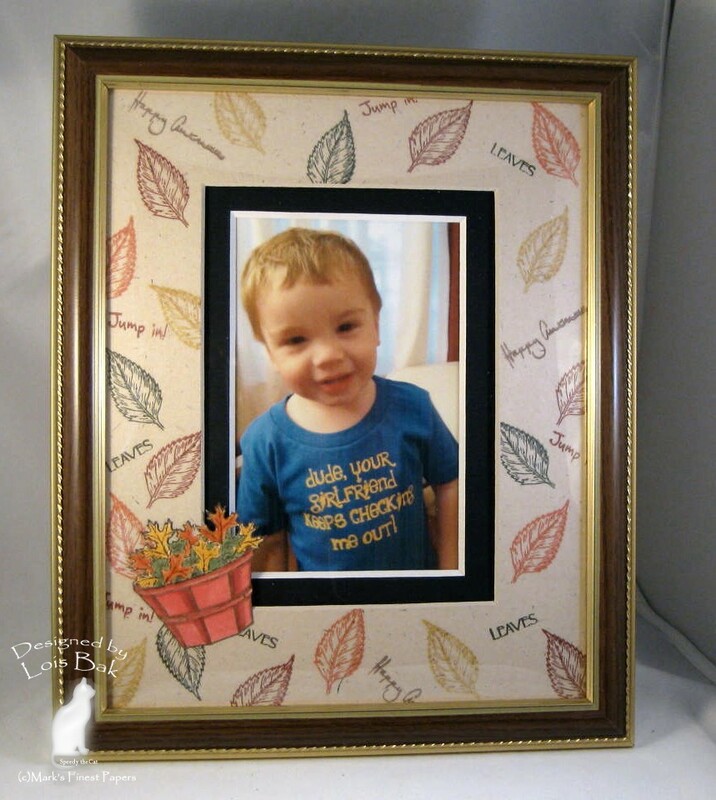 My second project is a picture frame. 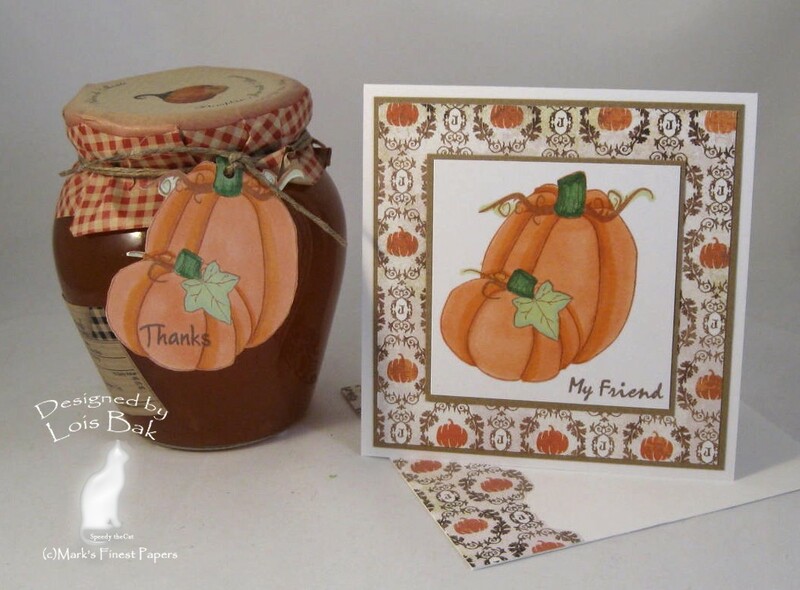 Using several of the smaller stamps from this versatile set, I decorated the mat in various fall colors. The basket of leaves is colored using Copic markers. The cute guy in the photo is my two-year old grandson William. 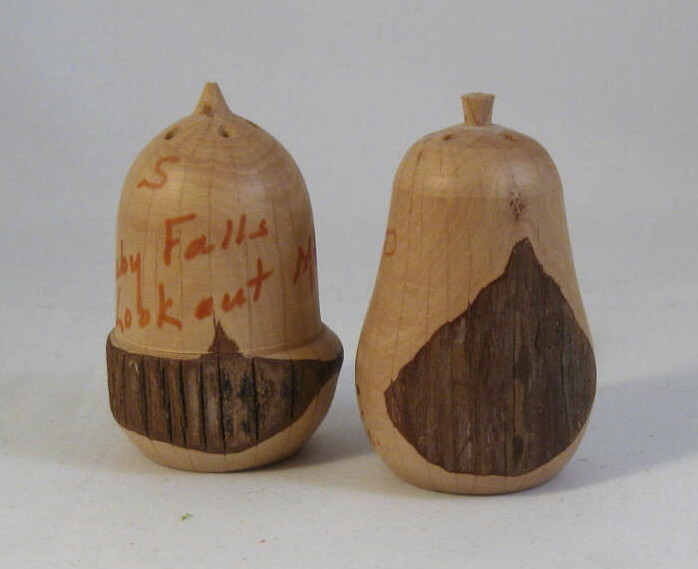 A set of acorn salt and pepper shakers I got at Ruby Falls/Lookout Mountain, Tennessee, where my late husband and I visited during our 25th anniversary trip to Nashville -- 23 years ago. He was a country music fan; I was/am a country music tolerator! Today's CAS challenge on Splitcoaststampers was a sketch. 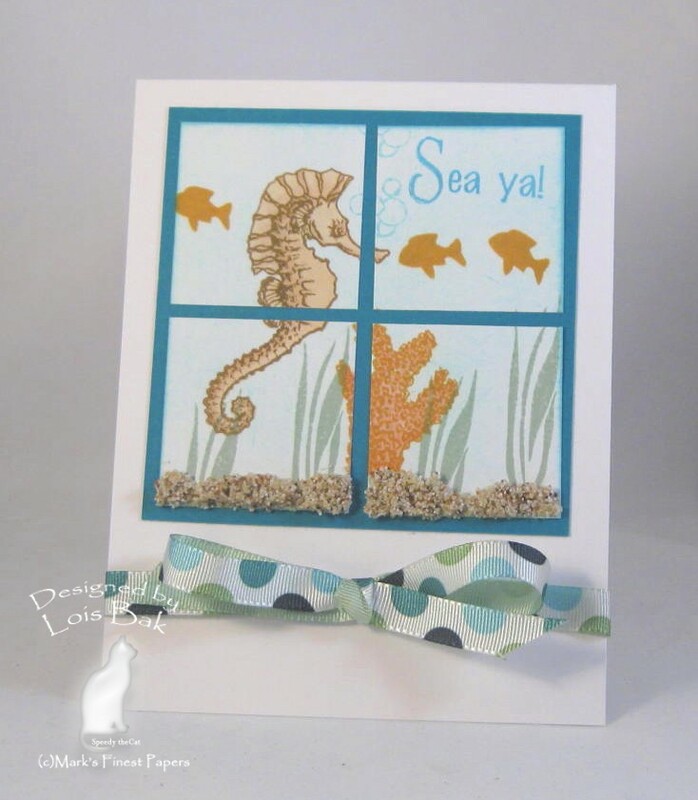 My CAS card is located under the sea, using Mark's Finest Papers cute set, Flourished Sea Creatures. Starting with white cardstock, I stamped this little scene and then sponged lightly over everything with some Palette Reflection Blue. After cutting the four squares, I added just a little bit of Mudd Puddles on the bottom two panels, simulating the ocean floor. The circles on the ribbon sort of reminded me of bubbles. These funky fish are part of my collection of about 125 sets of salt and pepper shakers. Today I was working on a commission from a woman in my office. Her daughter is giving a wedding shower for a friend and asked me to make a card for her. My co-worker bought the black and green papers and some ribbon because her daughter wanted the card to match the decorations for the shower. I had enough paper to make three cards. She can take one or all of them! I must admit that I perused the Wedding gallery at Splitcoaststampers to get my ideas. All three of my cards are CASEd. 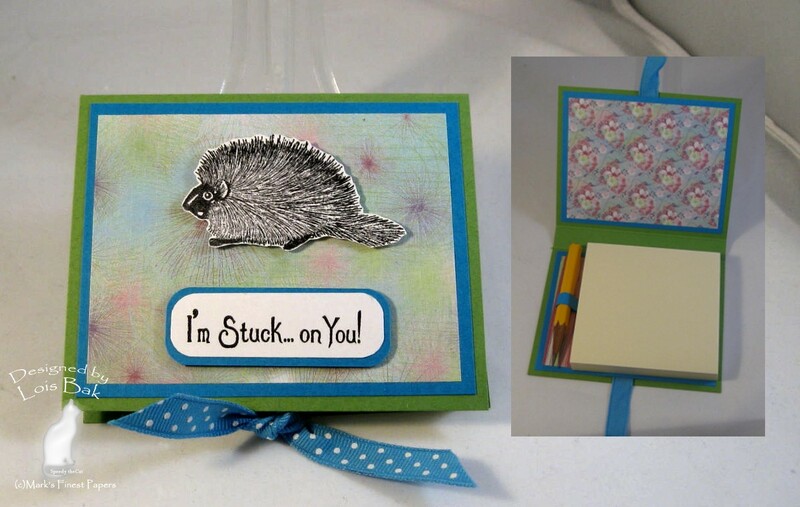 The first card is actually CASEd from this baby shower card by mandalee65. The card base is white, so that the inside is white; and I just cut a piece of the green to cover it. 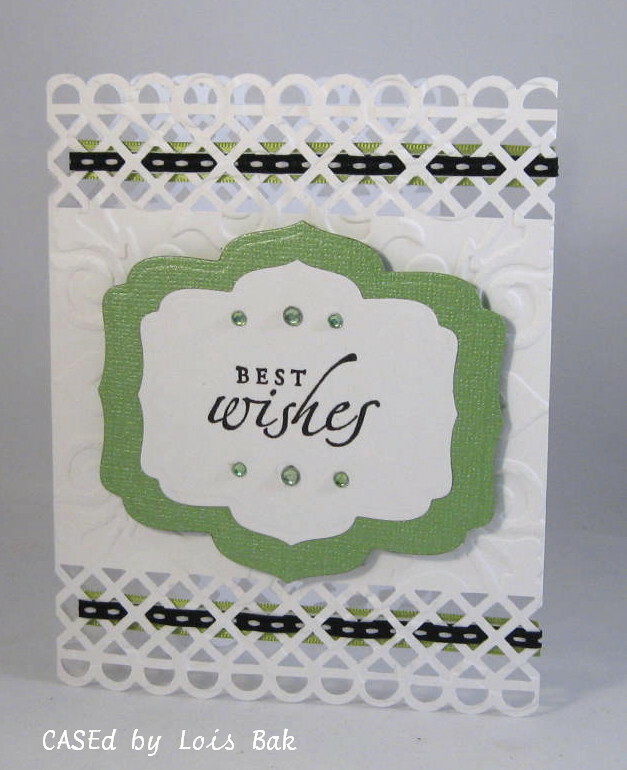 The white panel is embossed with the Cuttlebug Swiss Dots folder, and the next panel is cut with the Stampin'Up Top Note Die. After stamping the sentiment from one of a two-stamp set with black, I cut it out using a Shapeabilities tag and popping it up over the punched out green circle. The inside is stamped with the other stamp from that set. It says: And they lived happily ever after. The End. My second card is a CASE of this card by lbenden. 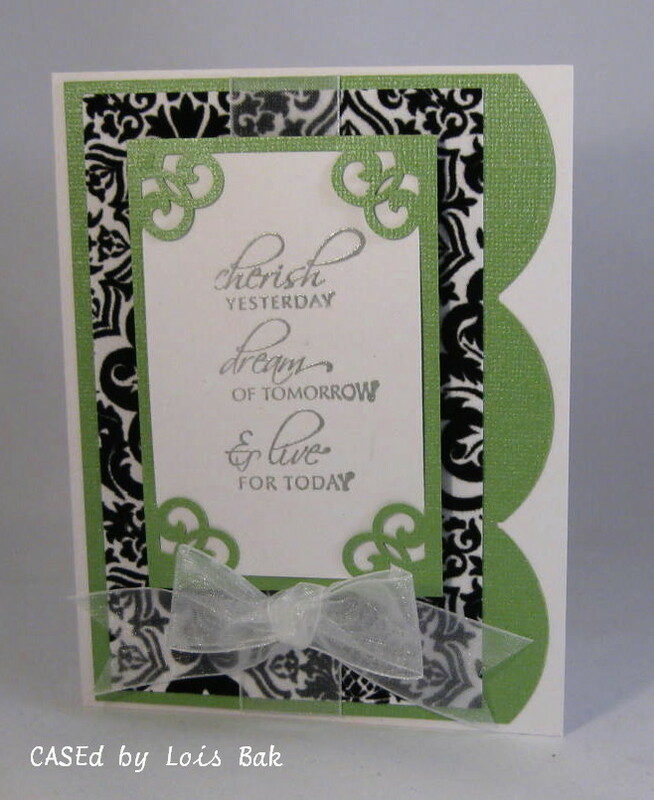 Again, the card base is white, the green panel is punched with an EK Success border punch. The sentiment is stamped in silver and then embossed. I like that corner punch -- it provides a mat and some interest at the corners. My last card I CASEd from this card by scrapgal2. Because the Flourishes white cardstock is so thick, I had to make sure I punched the borders at the right place so that, when the card is folded, the designs match up. 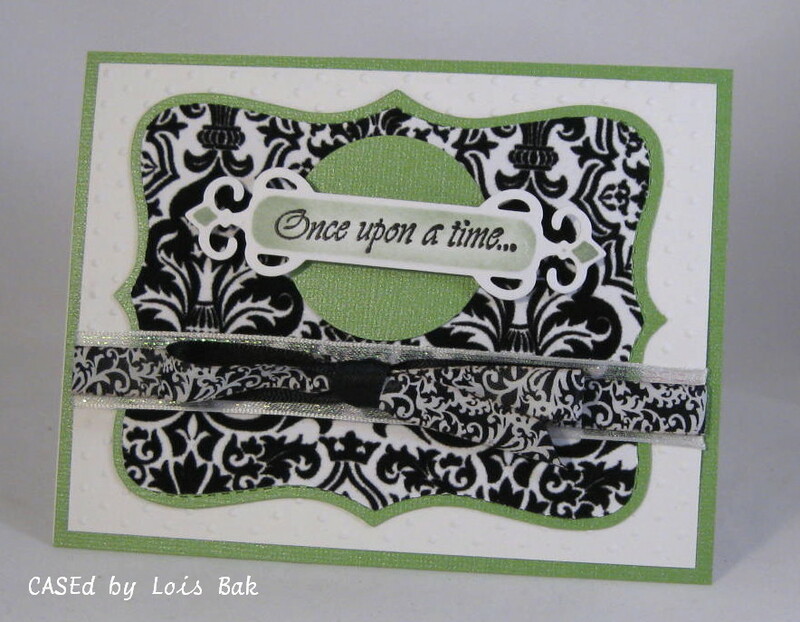 I wove the narrow black ribbon into the latticework and then backed it with the green ribbon. The rest is pretty self-explanatory. I may be stretching it a little with these salt and pepper shakers. I had nothing that even vaguely was related to a wedding shower. So the only set I had that MIGHT work was this set from Jamaica -- the colors on the flag match the colors of my cards. Brenda (Benzi) is the hostess for this week's Stampin'B's DT Blog challenge, and she wanted us to use a charm somewhere on our card this week. I rarely do one-layer cards, so this week’s card is something different for me. 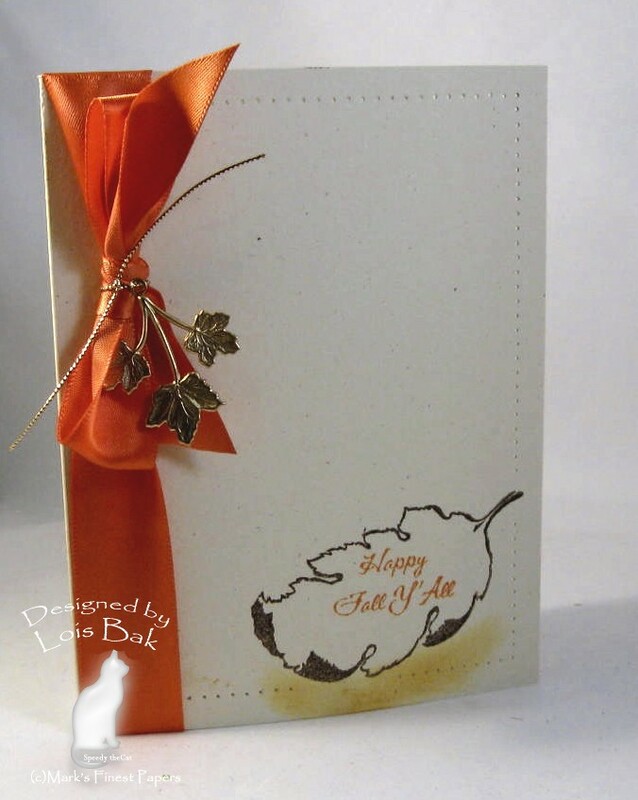 It is also a sneak peek at new set (Autumn Fun) from Mark’s Finest Papers that will be released next week. 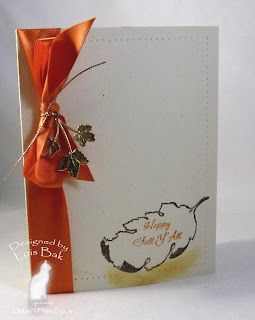 I stamped the leaf in Palette Burnt Umber, clear-embossed it, and then added the sentiment in orange. Even after I added the ribbon and charm, it looked a little bare, so I pierced around the edges.